The successful candidate will be required to provide engineering support on pre-factory and factory acceptance testing prior to release of equipment to the customer site, ensuring all pneumatics, tooling, software and entire functionality meets the required quality and customer specification. He/she will support the installation of equipment at the customer site, also providing after sales service support. Third level engineering qualification in mechanical, electro-mechanical or electrical discipline. 3-5 years experience in a service, test engineering, debug role. Available to travel and provide installation/service support at customer sites within and outside the EU. To provide engineering support for pre-factory and factory acceptance testing prior to release of equipment to customer sites, ensuring all pneumatics, tooling, software and entire functionality meets the required quality and customer specification. Liaise with other departments within the organisation on issues relating to the service engineering aspect of projects and ensure the department supervisor is fully updated. Support the installation of equipment at customer sites, ensuring site acceptance testing is complete, supporting the customer to ensure machines are fully up and running and all documentation complete. After sales service engineering support in line with service agreements. Ensure all service engineering documentation is complete as well as completion of Quality Management System records in order to maintain effective QMS. 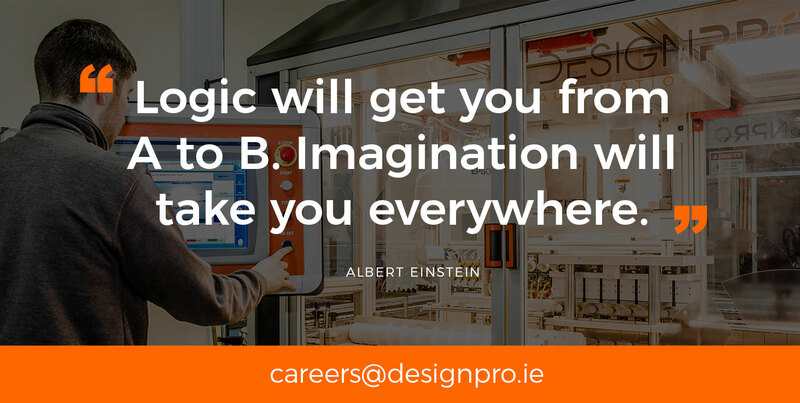 If you are interested in pursuing a career in a highly progressive, dynamic and team orientated environment, please submit your CV to careers@designpro.ie or contact the HR Department on +353 (0)69 63842 Ext 312 for further information. The closing date for receipt of applications is Friday 1st March, 2019.